It has been four years since there was a change to MIL-STD-129 so we were due for something new. For quite a while, we were expecting to see a convergence of MIL-STD-129 (labeling of packaging) and MIL-STD-130 (labeling of items) and it seems to be finally happening. One of the changes in the standard is that IUII information from Mil-STD-130 UID items will need to be included on the new MIL-STD-129 exterior and intermediate containers. Two new items are added that will affect all users printing MIL-STD-129 labels. The Contract Line Item (CLIN) and Contractor Shipment Number must be printed in barcode form on the Exterior Marking Label. This new data items are either encoded into Code39 barcodes or included in the PDF417 barcode. The two items are also required to be included in the PDF417 barcode on the MSL label. The Exterior Marking Label can be encoded with up to 5 serial numbers. If there are more than 5 serialized items included in the container, a separate listing of serial numbers (including barcodes) needs to be placed inside the package. 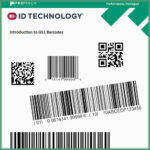 Until now, serial numbers were required to be encoded into Linear Code39 barcodes on the Unit Container, Intermediate Container and Exterior Container Labels. Under Change 4, this information now needs to be encoded into 2D PDF417 barcodes on these labels as well as the linear barcodes. Here is an example of a label made for a UID item. In this case, the DCMA official asked for the UID mark to be printed on the label as well because it could not be marked on this particular item. Also, this contract required RFID labeling for the item, so the RFID data has also been printed in barcode form. The RFID data consists of 24 hexadecimal characters. The 2D PDF417 barcode is encoded in accordance with ISO 15438, which is also used to encode the Datamatrix code on the UID labeling. The formatting is as shown in this table. If you need to comply with MIL-STD-129P Change 4 and need labels or help, call us at 603-598-1553 x237 or use our Contact Form.